B. Cox (BC): Al, thank you for taking the time for yet another interview. I would like to mostly speak about you, the photographer, your thoughts and experiences. 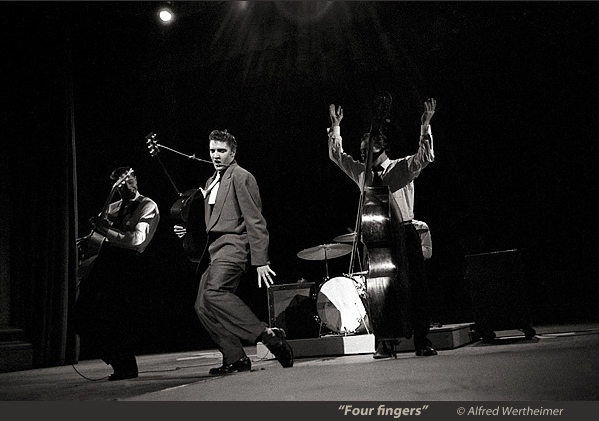 How did you secure the initial assignment to photograph Elvis and why did you choose black and white? 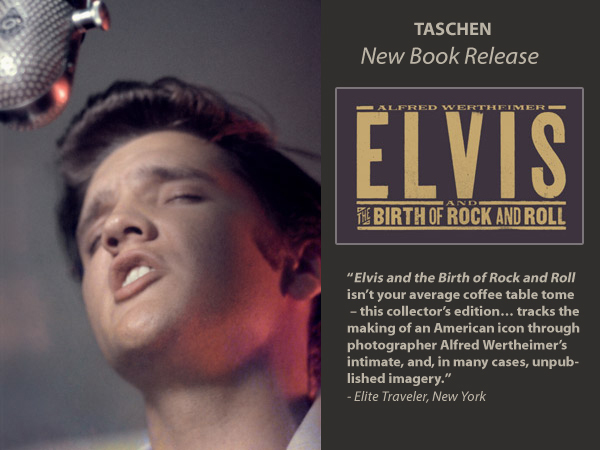 Al Wertheimer (AW): I had a working relationship with Ann Folcino, the PR person for RCA, who asked me about press photos for Elvis for her use. RCA signed Elvis in 1956. CBS was hosting a show with the Dorsey Brothers and Ann wanted press coverage: “ Don’t shoot colour, RCA wouldn’t pay for it”. Ann took me to a rehearsal space, two men were there, the younger one was Elvis, the other was a ring salesman, who sold him a ring. It was my first year in photojournalism. Ann asked if it was OK for me to shoot some pictures, Elvis agreed. BC: What was your relationship with Elvis and the Colonel at that time? AW: Ann, PR person from RCA, handled Elvis that first day. 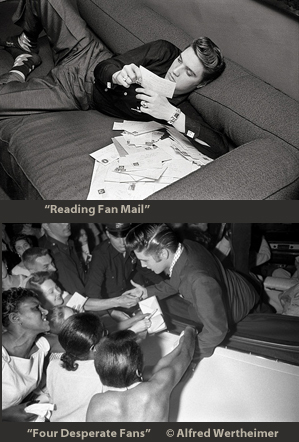 After rehearsal, Elvis went back to the Warwick Hotel, looked at fan mail, read it and shredded it. He did not ask me to back off. That evening we went back to the TV studio, for 6 minutes of airtime, 2 songs, and the kids in the audience went wild. My first encounter with the Colonel came at the rehearsal for the Steve Allen Show, June 29, 1956. He was a shrewd business man and acted like he was doing me a favour. He loved that I was photographing and wound up with a whole set of photos. He later sold the set to Elvis Presley Enterprises and never paid me royalties. Sept. 1956 an Elvis Magazine was released (the cover shot was mine), that sold 400,000 copies. BC: You had unprecedented access in the beginning. Why did you not pursue the relationship as Elvis became an icon? AW: I was spending my own money to follow Elvis and just couldn’t afford it at the time. RCA would not fund any more photos. I did take a train to Memphis to photograph Elvis’ family to round out the story. I shot 100 frames in colour, the rest in black and white. BC: Which image would you have liked to shoot, but didn’t have a chance to? BC: You have mined your Elvis archive to the utmost. What is your advice to other photographers in similar situations? AW: No one gave me advice. I had exclusive photos of someone who became a household word. I was able to report and document the change from “NOBODY to SOMEBODY” and many photos still have yet to be reproduced. A new genre was born, “Rock and Roll Photography”. As to advise to others: Keep your expenses down, don’t give your images away, there is a demand somewhere, there is the fan market, don’t sell yourself cheap. Hint: Behind the scenes shots plus your stage shots make a much more interesting story. BC : What makes a good photographer in your opinion? AW: A good photographer shoots what makes people tick, you have to be curious and observant. Have your subject involved in something other than being photographed. Example: “The Kiss”, Elvis and his date were oblivious to my presence, they were involved otherwise and payed no attention to me. Don’t ask them to do something, you’ll have broken the spell. Wait, be patient, be prepared, be curious and hopefully be lucky. Instead of following someone else’s style, learn your craft. Keep the composition clean. Make sure you have your background and foreground in check. I used 2 Nikons, one with a 35 mm and the other with a 105 mm lens. I tried to shoot from 8 to 10 feet away, no zoom lenses, not motorized, it makes the background blurry. I focused on the face and made sure to have background and foreground in check. Elvis permitted closeness, letting me get 3 to 4 feet next to him; he never flinched. Elvis’ performances made the girls cry from the balcony to the first row, he had that power. BC: Why didn’t you want to become the Rock and Roll photographer of record? AW: On September 22, 1958 I took my last photos of Elvis, now without sideburns, no longer the rebel the kids loved. In 1964 I fell in love with film and became a motion picture cameraman, and left still photography. BC: Thank you Al for a great interview. I was mostly interested in Al Wertheimer the photographer and his approach, and we explored that. Thanks for sharing with us your wisdom.